As I said on Instagram a few weeks ago, I’ve clearly been living under a rock because I up until now, I hadn’t ever tried a smoothie bowl. To be honest, I never quite saw the appeal. 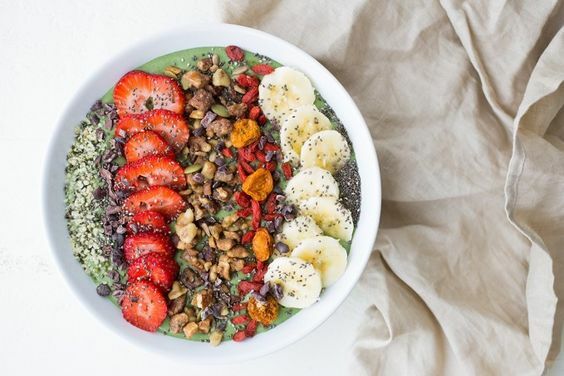 Regular ol’ smoothies seemed a lot easier and I wasn’t ever sure what toppings I’d add to a smoothie bowl. Enter Navitas Naturals. After Expo West, Navitas sent me an amazingly generous package full of nutritious superfoods including chia, golden berries, hemp seeds and cacao nibs. 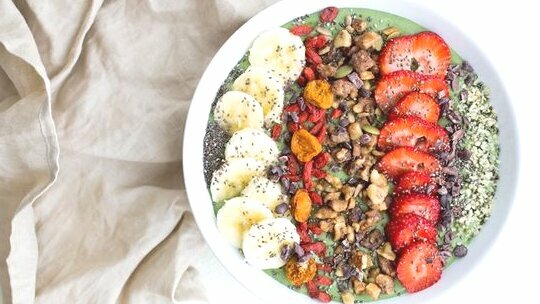 All of the sudden it hit me, it was finally time for me to jump on the smoothie bowl bandwagon! Armed with copious amounts of nutrient-dense superfoods, I set out to make the perfect smoothie bowl. In general, my requirements for smoothies are pretty strict. I really only feel good about having them under certain circumstances. First of all, they have to contain some form protein, fat and a low to moderate amount of complex carbohydrates. Ideally, I will always put something on top of my smoothies that requires chewing… thereby allowing my body to release vital digestive enzymes that assist with nutrient absorption and digestion. Without chewing, you might just miss out on absorbing a whole lot of nutrients and risk getting an upset stomach. Of course, last but not least, they also have to be delicious. 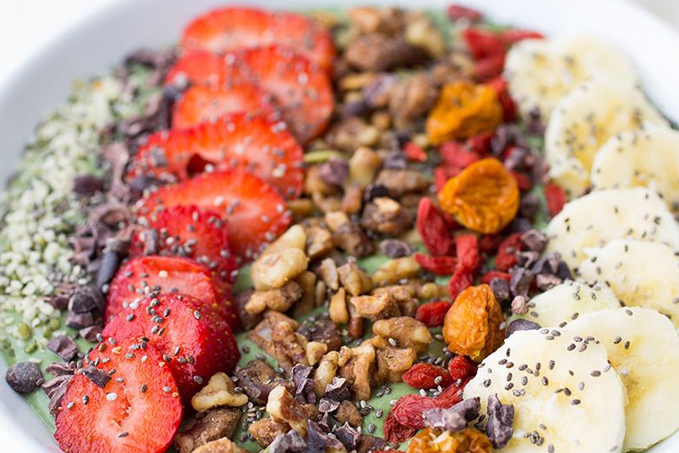 Most smoothie bowls or acai bowls often contain far too much sugar. This is partially probably why they never appealed to me. Often made with uber sweet fruits like mangos, pineapple, etc., they are topped with more sugar in the form of dried tropical fruits and processed granola or cereal. The sugar alone would have been enough, but it’s rare to find one of these with an ample amount of fat and protein to slow the absorption of sugar. My recommendation for smoothie bowls is that you make them at home where you can control the ingredients and and the nutritional profile. If you don’t have these specific ingredients on hand, don’t worry about it. Anything similar to this will do. As long as you include some form of protein, fat and complex carbs, you’re good to go! The combination of overall nutrition, lots of chewable ingredients and deliciousness has really won me over. 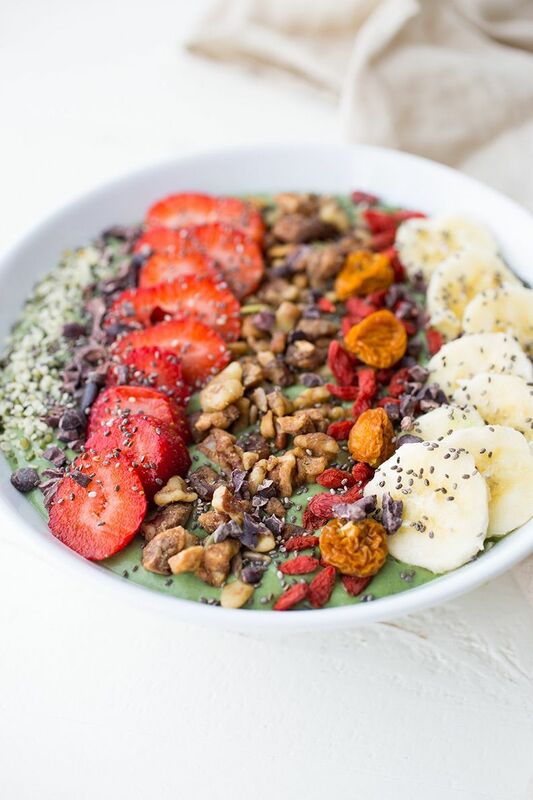 I wouldn’t be surprised if smoothie bowls start making an appearance more so than regular smoothies from here on out! Combine all smoothie ingredients in the order above to a high speed blender and process on low to high. 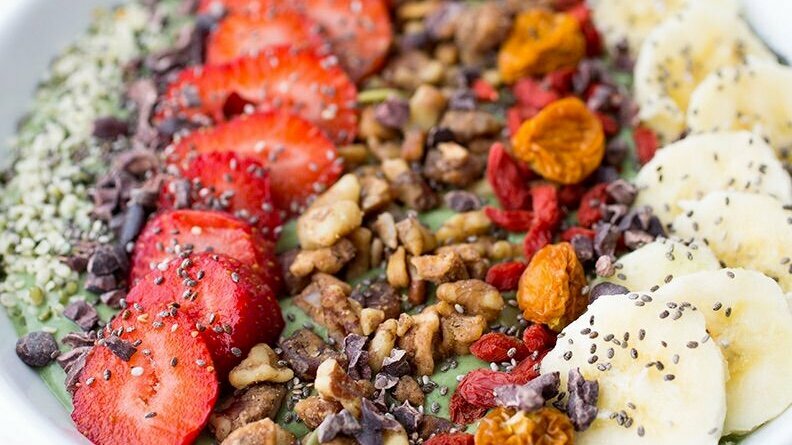 Once fully blended, pour smoothie into a bowl and top with your toppings. They don't have to look pretty, feel free to just throw them on in there! Eat with the toppings on top, or mix everything together, as I like to do.